This week’s article was written by CUESA’s Volunteer of the Month Janet McGarry. City dwellers may have enjoyed the sunshine during one of the driest winters on record, but the unseasonable weather has many farmers worried, and with good reason: their livelihoods hang in the balance. Fluctuations in weather do not necessarily indicate changes in climate, but climate change does impact the weather. Fearing the current weather patterns could be the new normal, California farmers are paying close attention to the forecast. On February 21, California Climate and Agriculture Network (CalCAN) convened farmers, scientists, and policymakers at the University of California, Davis, to discuss research and strategies for coping with the uncertainties of climate change. A coalition of sustainable agriculture and environmental organizations, CalCAN advocates for legislation that protects farmland, and supports farmers in adopting sustainable practices that reduce greenhouse gas (GHG) emissions and sequester carbon. Most recently, the organization has cosponsored the California Farmland Protection Act (AB 823), which would require the protection of one acre of farmland for every acre developed for urban or industrial use. Because an acre of paved land is associated with up to 70 times more GHG emissions than an acre of farmland, CalCAN believes that farmland preservation is an important strategy for addressing climate change. Researchers predict climate change will influence California growing conditions in numerous ways. Rising temperatures are likely to result in less snow and more rain during the winter months, which means the Sierra Nevada snowpack, the state’s primary water storage source, could shrink. As a result, water resources for irrigation will be in shorter supply. Climate change could also lead to more extreme weather events such as droughts, floods, heat waves, and late frosts. Higher temperatures and increased levels of carbon dioxide could mean more pests and diseases for crops and livestock. Rising temperatures have already begun to impact California’s fruit and nuts, some of the state’s most lucrative crops. These crops require cooler temperatures, known as “chill hours,” in order for fruit to set properly. Warmer weather has decreased the number of chill hours, and climate models predict that this trend will continue. For example, a 2011 study by Stanford researchers predicts that warmer nights could reduce premium grape harvests in Napa by 50% by 2040. 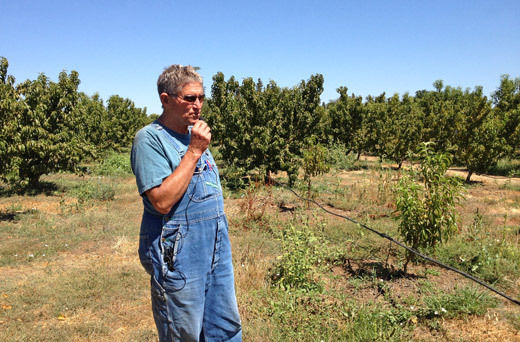 At the CalCAN summit, “Farmer Al” Courchesne (pictured above at a CUESA farm tour) spoke about the impact of decreased chill hours at Frog Hollow Farm. In 1976, Farmer Al chose to farm in Brentwood because the soil and climate provided a “Garden of Eden” for growing stone fruit. But today, the farm gets only 600 or 700 chill hours instead of the necessary 1,000. Agriculture is not only impacted by climate change but is also one of its largest contributors. The global food system, including production and distribution, accounts for almost a third of GHG emissions.California is the largest producer of agricultural crops in the country and the twelfth largest producer of GHG in the world. On farms, conservation measures such as renewable energy production, use of energy-efficient equipment, and decreased reliance on fossil-fuel-based pesticides and fertilizers help to reduce GHG emissions. Farmers can cut nitrous oxide emissions by avoiding heavy irrigation after applying fertilizer or by using subsurface irrigation, such as drip lines, rather than surface irrigation. Water conservation measures are doubly beneficial: not only do they sustain farms in times of drought, but they also reduce the energy required to pump water. According to CalCAN, organic and sustainable farming practices can create healthy farm ecosystems that are resilient to stress while mitigating the impact on climate change. Use of cover crops, manure, and compost increases carbon storage in soils and minimizes the need for petroleum-based fertilizers. 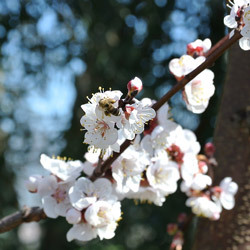 Trees, shrubs, and hedgerows on farms also sequester carbon and create habitat for biodiversity. One way Farmer Al is addressing the climate crisis is by amending his soil with compost made from farm waste. 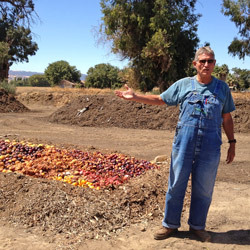 When a soil biologist visited Frog Hollow Farm a couple years ago and saw that one third of the farm’s fruit was wasted because it was blemished and could not be sold, he suggested that Farmer Al start a compost pile. When left to rot, fruit releases methane (a strong GHG) into the atmosphere through anaerobic decomposition, but when converted into nutrient-rich compost that is added to the farm’s soil, it helps store carbon. Pruned orchard branches (which are often burned by farmers) and bedding from a neighboring horse ranch are also added to Frog Hollow’s pile, where their carbon can be put to good use. Support the California Farmland Protection Act (AB 823). Take action today.